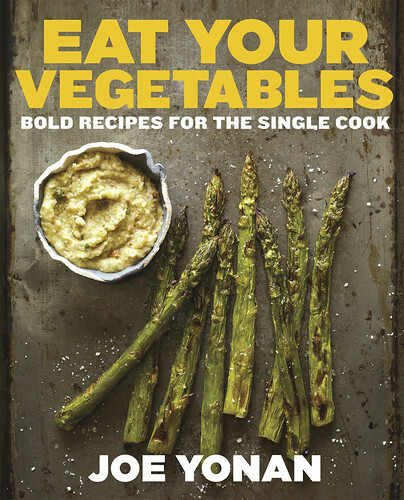 Eat Your Vegetables Cookbook Giveaway! An increasing number of people are showing interest in plant-based meals, some for the nutritional benefit, some looking to add a sustainable practice and others in search of economic value. Eat Your Vegetables by Joe Yonan, is the perfect book for anyone looking to expand their produce-based culinary repertoire. Yonan’s friendly voice and straight forward cooking style empowers both the home cook and the experienced vegetarian chef to be bold and pursue their vegetable-centric interest, even if the pursuit only yields a single serving. “It's been my ongoing mission to get single folks - 31 million of us in the United States alone - to realize that cooking for ourselves, despite the obstacles, is a worthwhile, satisfying, potentially meditative, possibly invigorating, and maybe even delightful endeavor." This book is filled with 80 inspired vegetarian, vegan, and flexitarian recipes such as Spicy Kale Salad with Miso-Mushroom Omelet, Thai-Style Kabocha Squash and Tofu Curry, and a One Peach Crisp with Cardamom and Honey. In addition to these out-of-the-box recipes, look for the everyday tips on shopping, storing, and salvaging leftover ingredients. Joe Yonan is the Food and Travel editor for the Washington Post, where he writes regular features, including the “Weeknight Vegetarian” column. He is the author of Serve Yourself: Nightly Adventures in Cooking for One , which Serious Eats called “truly thoughtful, useful, and incredibly delicious.” Yonan has won awards for writing and editing from the James Beard Foundation, the Association of Food Journalists, and the Society of American Travel Writers, and his work has been featured three times in the Best Food Writing Anthology. book to give away to one of you! To win a copy of Eat Your Vegetables, simply leave a comment below answering this question by Tuesday, March 4, 2014 (one entry per person please). What is your go-to food item when cooking for one? No purchase required. Limit one entry per person, please. Entries will close on Tuesday, March 4, 2014 at 8:00 am. Winners are chosen by Random Number Generator and announced on our blog on Tuesday, March 4, 2014. Thank you for all the amazing comments! They were so wonderful that we chose TWO WINNERS! When I'm cooking for one, I like having my meal in a bowl. My favorite thing is to make homemade udon noodles with a spicy miso broth, poached egg, and throwing in some fresh mushrooms and spinach. 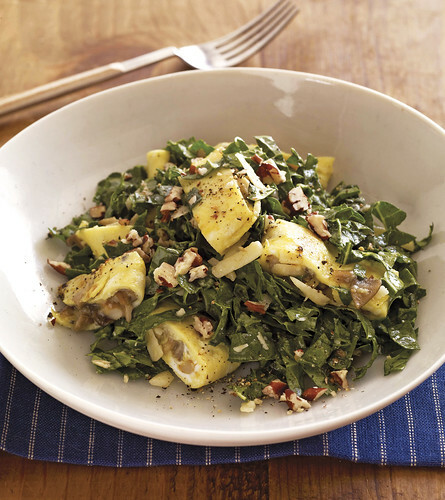 I'd love more ways to incorporate veggies in my meals. I love Kale in soups or sauté with garlic. I also use it in juicing or smoothies. The Kale that comes in the Farm Fresh box is so fresh and delicious. I love getting my Farm Fresh box -- it's like Christmas every other Tuesday. Thank you to Joe Yonan and Ten Speed Press. Be sure to check out Eat Your Vegetables.